Apple and some other companies will soon have to explain to the Australian Parliament why content from iTunes is more expensive for Australian consumers that for consumers in U.S. According to The Sydney Morning Herald, the Minister for Communications Stephen Conroy has approved a parliamentary inquiry that will be held sometimes this year. The report noted that the parliamentary inquiry could embrace eBooks if evidence of unfair pricing for Australian consumers emerges. Back in July 2011, Apple reduced the price of iOS apps for Australian consumers by up to 25% addressing the criticism raised in Parliament by federal Labor MP Ed Husic. However, it is for the first time the Parliament has asked Apple to explain its pricing practices for the Australian market. 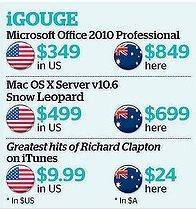 Last week the issue surfaced again with the launch of Adobe’s CS6 software suite, which costs $1,400 more for consumers in Australia. “In very broad terms, for example, and taking into account taxes and currency variations, it turned out that the 13-inch (33cm) MacBook Pro costs $1399 here and $1218 in the US, the 17-inch MacBook Pro costs $2899 here and $2700 in the US, and the 8-gigabyte iPod Touch costs $289 here and $247 in the US” . Brazil market is also experiencing this issue with the launch of the new Apple TV that costs $211 there, while in the U.S. and elsewhere it is available for $99.